A VPS simply means a “Virtual Private Server”. It is one of many virtual computers running on a single server. A VPS is your own virtual computer running 24 hours a day, 7 days a week, completely uninterrupted. On VPS, the platform is running on a remote server that is accessible any time from any computer, tablet or smartphone connected to the internet. You can also run up to six different instances of the MT4 terminal – depending on how many charts, indicators and EAs you have running. This is ideal if you want to trade and run your EAs on different accounts. By running your trades on a VPS server, you won’t need to install multiple instances of MT4 on your computer, everything is kept and run seamlessly on the server. To receive a virtual terminal on a virtual server, connect using your chosen trading account and execute “Register a Virtual Server” command in the context menu. The Virtual Hosting Wizard window will then appear. This shows how the virtual hosting network works. The process of obtaining a virtual server consists of three steps. First of all you will find out how to prepare for migration. After that, you will then need to select the nearest virtual server with minimal network latency to your broker’s trade server. only trade copying – only Signal copying settings (no charts or programs) are moved. After selecting the migration mode, you can launch the virtual server immediately by clicking “Migrate now”. You can also do that at a later time. Before launching the virtual terminal, you should prepare an active environment for it – charts, launched indicators and Expert Advisors, Signal copying parameters and the terminal settings. Charts and Market Watch – hide all unnecessary trading instruments from the Market Watch to reduce the traffic. Close unnecessary charts. In the terminal settings, specify the required value of “Max. bars in the window “- the terminal should be restarted after that. 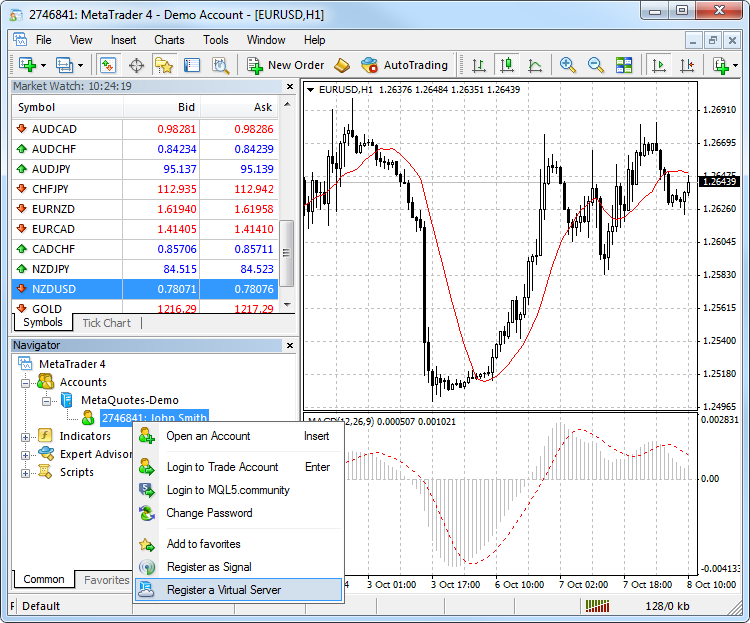 Indicators and Expert Advisors – attach the required EAs and indicators to your charts. Products purchased on the Market and launched on the chart are also moved during migration. They remain completely functional, and the number of available activations is not decreased. All external parameters of indicators and Expert Advisors should be set correctly. Email, FTP and Signals – if an Expert Advisor is to send emails, upload data via FTP or copy Signal trades, make sure to specify all necessary settings. Set correct login and password of your MQL5.community account on the Community tab. This is necessary for Signal copying. Permission to trade and copy signals – the automated trading is always allowed in the virtual terminal. To work with the signals, set copying parameters in the Signals section. WebRequest – if a program that is to operate in the virtual terminal uses the WebReqest() function for sending HTTP requests, you should set permission and list all trusted URLs on the Expert Advisors tab. Migration is the process of transferring the current active environment from the client terminal to the virtual one. Migration is performed during each synchronization of the client terminal. Synchronization is always a one-direction process – the client terminal’s environment is moved to the virtual terminal but never vice versa. The virtual terminal status can be monitored via requesting the terminal’s and Expert Advisors’ logs as well as virtual server’s monitoring data. To perform synchronization, execute “Synchronize Environment” command and select migration type. You can always change the number of charts and the list of symbols, the set of launched programs and their input parameters, the terminal settings and Signal subscription. 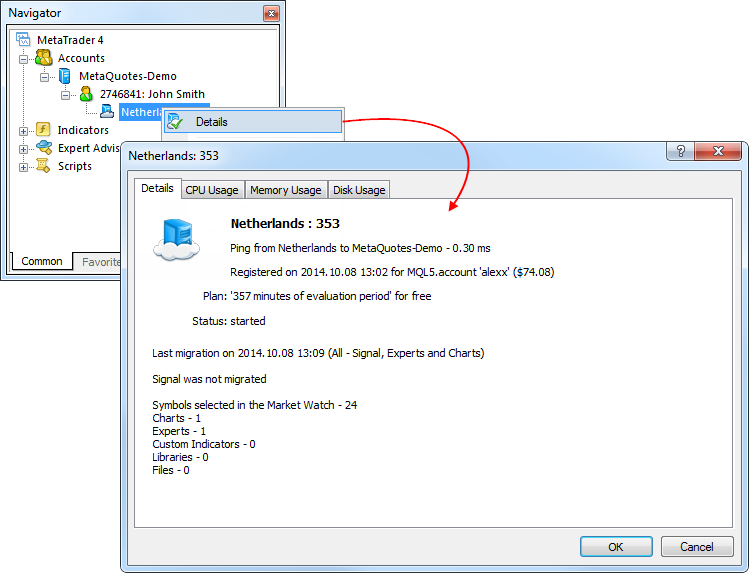 When performing migration, all data is recorded in the client terminal’s log. 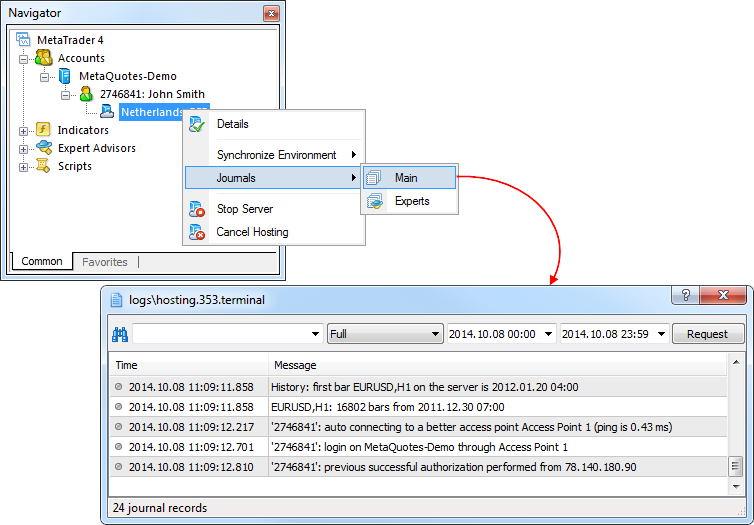 After the synchronization, open the virtual terminal’s main journal to examine the actions performed on it. The rented virtual server status can also be easily monitored from the client terminal. Execute “Details” command in the context menu. The information is presented in four tabs: Details – data on the virtual server itself and the terminal’s active environment. CPU Usage – CPU usage graph, %. Memory Usage – memory usage graph, Mb. Hard Disk Usage – hard disk usage graph, Mb.